If you are a heavy data user like me, you may be looking for the best data plan that offers awesome benefits at a cheap price. One of the plans you should try out is Etisalat Smartpaks. Smartpaks is an innovative Etisalat data plan that allows subscribers unlimited access to interesting apps and features to surf endlessly. 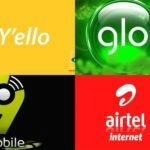 The (9mobile) Etisalat data plan offers great value for the money. It allows you to watch your favorite movies, watch live sports, get social, chat and so forth all in one app bundle. Etisalat Smartpaks is designed for all and sundry. No matter your needs and budget, you can find the right pak suitable for you. 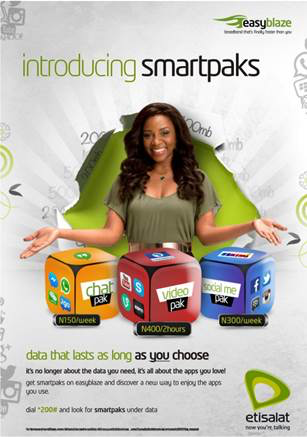 Etisalat Smartpaks offers three basic packages (known as paks): the chat pak, the video pak, and the social me pak. You can choose the plan that suits your lifestyle and unique needs. You can subscribe to the Etisalat data plan by dialing *200#, selecting option 3 corresponding to the data menu and again selection option 3 in the next menu for Smartpaks. Both the Smartpaks chat pak and social me pak have daily, weekly, and monthly plans. The daily plan for the chat pak costs N50, the weekly plan N150 while the monthly plan costs N400. You can subscribe by dialing *343*5*5#, *343*5*6#, *343*5*7# respectively for each of these plans. 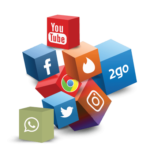 While the chat pak gives you access to instant messaging apps such as Whatsapp, BBM, and Wechat, the social me paks gives you access to social media sites such as Facebook, Twitter, Instagram and also Whatsapp, BBM, and Wechat. 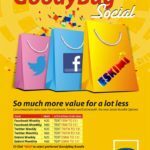 The social me daily plan costs N100, the weekly plan costs N300 while the monthly plan costs N700. You can subscribe by dialing *343*6*7#, *343*6*8#, *343*6*9# respectively for each of these plans. 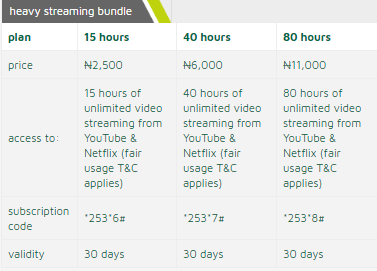 With the video pak package of the Etisalat data plan, you can enjoy uninterrupted video streaming for 2 hours, 3 hours or 7 hours. The 2 hours plan costs N400, the three hours plan costs N500 while the 7 hours plan costs N10000. You can subscribe by dialing *292*3*5#, *253*1#, *253*2# respectively for each of these plans. The Etisalat data plan also includes special smart chat pak, special smart social pak, and heavy streaming bundle. 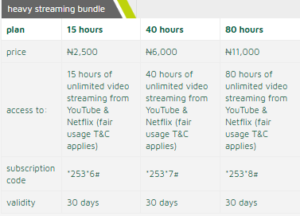 It includes three heavy streaming bundles, namely 15 hours, 40 hours and 80 hours heavy streaming bundles with prices N2,500, N6,000 and N11,000 respectively and valid for 30 days. Below is a table showing the heavy streaming data plan.